Proteinase K from Parengyodontium album (Tritirachium album) is a subtilisin-related serine protease. It is a broad spectrum endopeptidase with very high specific activity. It is widely used for digestion of proteins, including DNases and RNases, during nucleic acid preparations without compromising integrity of isolated DNA or RNA. 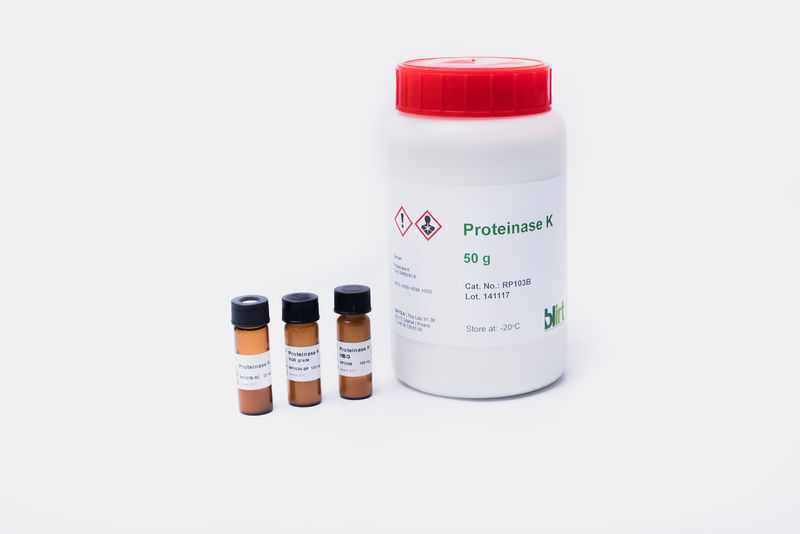 Proteinase K is active under wide range of reaction conditions, including elevated temperatures and presence of SDS. This recombinant enzyme is expressed in Pichia pastoris, and undergoes extensive purification to yield the highest quality product. An extra purification step results in significantly increased solubility (2.5 fold), increased specific activity, and decreased DNA content, compared to our Molecular Biology Grade product. 20-50 mg/ml solutions: use purified water for immediate use, or 50% glycerol in purified water (v/v) for long-term storage at -20˚C. < 20 mg/ml solutions: use 50 mM Tris-HCl, pH = 7.8, 3 mM CaCl2 for immediate use, or 50 mM Tris-HCl, pH = 7.8, 3 mM CaCl2 , 50% glycerol for long-term storage at -20˚C.